One problem with servos is that they cost a lot more than DC motors. The basic idea behind converting a DC motor to servo is to find the position of the shaft and apply a DC voltage to get the Shaft to the expected position. //Please use a low rpm motor. Not more than about 500 rpm. //to do this, otherwise even a slight misalignment may cause trouble. //2. Fix the body of the potentiometer to a rigid surface such as the body of the motor,//so that when the motor shaft turns, only the potentiometer shaft turns with it. // potentiometer reading when motor shaft is at 180 degree position. //potentiometer reading when when motor shaft is at 0 degree position. //To fill up the correct values, first turn the motor shaft manually to 0 degree position. //Now read the potentiometer value and edit the #define POT_VALUE_MIN line with your pot reading. //read the pot value and edit #define POT_VALUE_MAX line with your pot reading. 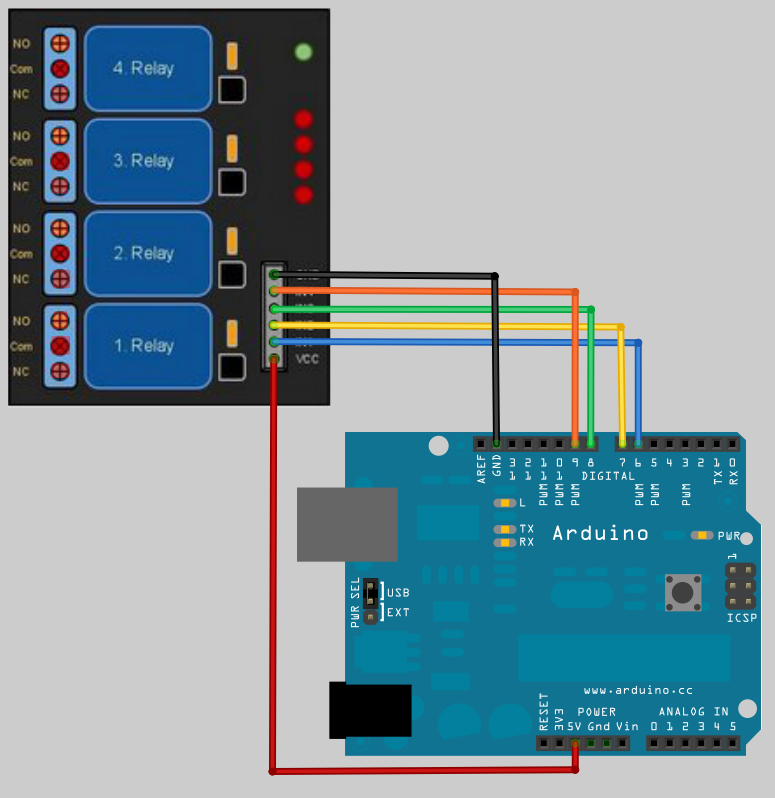 To connect the 4 Relay board to an Arduino is very easy. You only need to connect the Arduino +5v to the 4 Relay board VCC pin and an Arduino Ground to the 4 Relay board GND pin. Then it’s a matter of just connecting some data pins from the Arduino to the 4 Relay board IN pins. In the example code below I used Arduino pins 7, 8 , 9, 10. I didn’t use the same digital pins as the LEDs because they are inversed to each other. The LEDs get power from the Arduino, that means when the digital pin is HIGH (1) it has +5v on the line and the LED lights up. The relay commands are the opposite to this and the relay is switched with the IN pin is set LOW (0). The relays default state is to connect COM to NC (normally closed), this is also done by setting the relays IN pin HIGH. This is a safety feature in-case you Arduino looses power it turns off all the relay switches. To change the relays state so NO (Normally Open) the pin is set to LOW. I have some 12v DC lights that I want to activate like LEDs as a VU meter. the line to the lights connects to the relays NO connector. The NC connect is left empty. Example of connecting Lights to the relays. Only work with AC if you really know what your doing, it can kill. Relays work on electromagnetism, When the Relay coil is energized it acts like a magnet and changes the position of a switch. The circuit which powers the coil is completely isolated from the part which switches ON/OFF, This provides electrical isolation. This is the reason we can control a relay using 5V's from an arduino and the other end of it could be running an 230V appliance, the 230V end is completely isolated from the 5V arduino circuitry. To connect the 4 Relay board to an Arduino is very easy and allows you to turn on and off an wide range of devices, both AC and DC. The first to connections are the ground and power pins, You need to connect the Arduino +5v to the 4 Relay board VCC pin and the Arduino ground to the 4 Relay board GND pin. Then it’s a only a matter of just connecting the communication pins, labeled IN1, IN2, IN3 and IN4, two 4 data pinson the Arduino.In the example code below we used Arduino pins 7, 8 , 9, 10. Its a good idea to avoid using Data pins 0 and 1 as they are used by the Arduino for serial communication and can cause problems when uploading code to the Arduino. The default state of the relay when the power is off for COMM (power) to be connected to NC (normally closed), this is the equivalent of setting the 4 Relay boards IN pin to HIGH (has +5v sent to it) It is a safety feature to notuse the NC connector in-case you Arduino looses power it will automatically turns off all the devices connected to the relay. When you have something connected to the relays NO (Normally Open) connector and you set the corresponding IN pin to LOW (0v), power will flow in from the COMM connector and out of the NO connectorpowering your device.. Above: Example of connecting power and lights to a relays COM and NO connectors. Below: Connecting to the Arduino. // Each relay is turned on for 2 seconds and then off. // light up when the relay is on. This wonder kit allows you to control any electric appliance from the internet. It means you can turn ON/OFF any appliance at your home from your iphone, Android, ipad, PC or laptop from Anywhere in the world..As long as you have access to a web browser. Woooo..aint that an amazing power to lay your hands on. What would I do with a Web Switch ? What does the kit consist of ? This shield allows the Arduino to talk to any other device connected via Internet. The shield has an ethernet port which will be later used to connect the ethernet cable. Once thats done it would look like this. Stack the Sensor Shield on top of the Ethernet shield, as shown in pic below. TEST: Power up the arduino and you should see the GREEN led on relay module glowing. If you dont see that revisit your wiring and make sure everything is correct. We are about to test if the wiring is good and the relay turns ON and OFF. Load this program into the arduino from this link. This program turn ON the RELAY module for a 3 secs and turns it OFF for another 2 secs and keeps doing that. How do you know if the relay is turning on? You hear a click every time the relay operates and you see the RED led glowing every time it is turned ON. This test should test if the wiring it good and the arduino is able to control the relay. Now that all the modules are tested, we are almost there.. The last bit which needs doing is to load the Web Switch code and turn your kettle on! Load this code (link provided on purchase) onto the Arduino. You are now able to control the Arduino via the Browser. To control the Kettle you will need to connect the Relay as a switch for the Kettle. Disclaimer: any modification work that involves high voltages should be done by a certified electrician. This Web Switch kit is provided by Hobbyist Ltd "as is" with no warranty of any kind whatsoever. It is your responsibility to ensure your safety and proper functioning of your devices and applicances. Should you have any concern about health and safety please consult a professional for advice. Get a WebSwitch for yourself? The code for reading the Sensor data and displaying it on the LCD is available (provided on purchase), The code is very easy to read and understand and you can tweak it to your advantage..
Once the code is loaded the Weather Station should be reading the Temperature and Humidity reading and displaying it on the cool blue backlight screen!!! NOTE: We leave the interfacing of the light sensor as a task for the hobbyist, But if you get stuck drop us a line and we will send you the link to interface it!